Kilmarnock is a 500 cell prison facility operated by Serco Ltd on behalf of the Scottish Prison Service under a contract with the Scottish Ministers. It is situated approximately three miles south-east of Hurlford in East Ayrshire. Housing a range of prisoner types, Kilmarnock is the local receiving establishment primarily taking prisoners from the Sheriff Courts of Ayr and Kilmarnock.Contracted to provide purposeful activity for the prisoners, Kilmarnock has an industries department comprising six work units, and provides work opportunities for both remand and convicted prisoners. The proportion of convicted prisoners makes up approximately 80% of our population. In providing some of these purposeful activities Kilmarnock, where possible, takes the opportunity to incorporate vocational training with the intention of providing prisoners with externally recognised qualifications. Serco Ltd is a company incorporated under the Companies Acts and has a registered address at Serco House, 16 Bartley Wood Business Park, Bartley Way, Hook, RG27 9UY. The land on which the prison is built was used for agricultural purposes prior to construction starting; however before this it was the location of a munitions factory for the Air Ministry. In 1968 the site was abandoned by the government and its agricultural use commenced. If sending a letter to a prisoner, put their name, prison number and location, followed by the postal address. · Take the A78 towards Irvine/Ayr, then follows signs for Town Centre/Harbourside/Crosshouse. · At the roundabout, take the 1st exit and follow the A71 to the roundabout with the A77, and take the 4th Exit signposted Cumnock and Mauchline. · After approx. 1.5 miles, take the second exit at the roundabout and enter the prison drive. · Take the M8/M77/A77 towards Kilmarnock. · Take the exit signposted A735/A71/A76 for Kilmarnock/Irvine/Dumfries/Edinburgh. · At the roundabout, take the 2nd exit signposted Cumnock and Mauchline. · Take the A77 towards Kilmarnock. Stagecoach bus X76 from Kilmarnock Bus Station passes the prison. The closest railway station to the prison is Kilmarnock. Contact Scotrail on http://admin.scotrail.co.uk/enquirieshttp://admin.scotrail.co.uk/enquiries for further information. From the station you can access to public transport to reach the establishment. There are extensive public parking facilities, which include disabled spaces, for visitors to Kilmarnock. Disabled parking is located directly opposite the visitors centre. 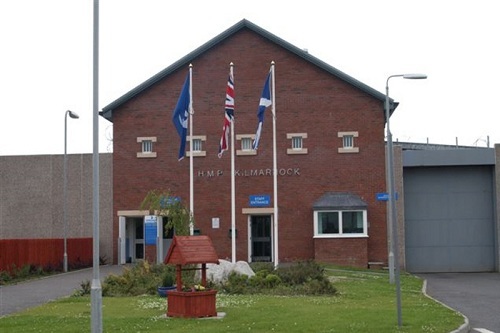 All offenders at Kilmarnock are responsible for booking their own visits and also have the responsibility to inform their visitors of the day and time of the visit. To gain access to the prison for the purpose of visiting, you must have two forms of identification, one photographic and one showing your current address. Entry to the prison will not be permitted without acceptable identification. The visitor centre at Kilmarnock is staffed by operational support officer’s within the opening hours. Representatives from the Lighthouse Foundation are in the visitor’s centre 3 days a week providing meaningful support for families affected by imprisonment. The centre offers a welcoming and supportive environment, particularly for first time visitors who are unsure of prison procedures.You will need a £1 coin to operate the locker which is refundable. Toilet facilities are available. Everyone attending the prison for a visit must book in at the visitor centre, at least 20 minutes before the visit session starts. This is to allow sufficient time to process your details and to go through the search process prior to entering the Visits Hall. Once your details have been recorded visitors will be asked to make their way across to the main prison building. All visitors will be asked to remove footwear, outdoor jackets and any metallic items. You will then be asked to walk through a metal detector and may be subject to a rub down search by a member of staff. Additionally, the search procedure may incorporate the use of an Ion Spectrometer and passive drug dogs. Once the search process has been completed visitors will be allocated a table number and you will then be asked to enter into the visit hall. At the end of the visit a member of staff will inform all visits that the time has elapsed and you will be asked to exit. In the visit room, all our officers are FCO’s and are available throughout your visit if you require any information or you have any concerns please feel free to speak to them. There are toilet facilities, including disabled toilets and baby changing facilities available as well as a children’s play area. Click here for information on the Scottish Legal Aid Board web site for solicitors looking to register for and use video link technology to conduct meetings with their clients in custody. Property for convicted and untried prisoners may be handed in at the Visitors Centre during the Centre's opening times. Visitors handing in property are required to be on the prisoners approved visitors list and if they have not attended a visit previously will be required to provide appropriate identification. Property can be sent to prisoners in the post, provided a completed pro-forma is included in the parcel. Mark the parcel for the prisoner's attention. To ensure the parcel arrives safely, you can send it recorded delivery (cost incurred at the post office). You may deposit money for a prisoner at the Main Gate of the Prison. You must provide the prisoner's full name and prison number. A receipt will be issued to you. (If you are unsure, please ask a member of staff). Cheques will be accepted, and should be made out to Serco Ltd (this will take 5 working days to clear). You can post money into a prisoner for their PPC, however we would strongly recommend either recorded/special delivery (cost incurred at the post office) when posting cash or you can post a cheque or postal order (again there is a cost incurred at the post office for the order) in. Both of these should be made payable to Serco Ltd. but please note the prisoners details on the back of the order or cheque. need for the day ahead.